Speaking with Mary Ferazza about Social Practice Art and discussing the possibility of a future Shared Spaces event in Pullman, on the South Side of Chicago. Joanna Pinsky, leading an Art Encounter group at SOFA, spent several minutes discussing Shared Spaces Study #5 with me and her group. “I’m responding as an artist to how things are out there in the US these days – to the fractured dialog, the mistrust and anger. 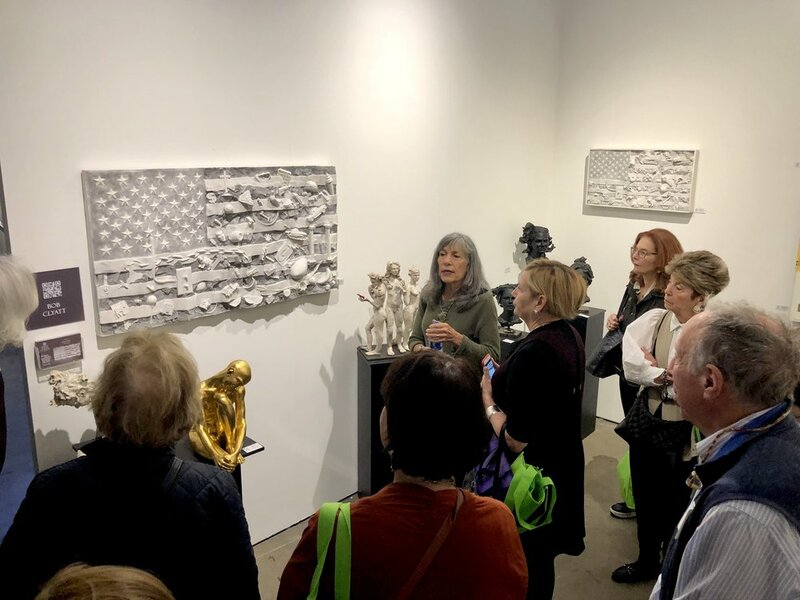 Here’s how it works: I bring my clay to communities around the US and invite people to bring and select objects which we help them to imprint into the Shared Space of the American flag. This literally forms the mold into which we cast blended plaster and ground marble to create a community-owned wall relief sculpture. By pulling together these flag works, filled with all kinds of different meaningful objects and symbols, in communities which themselves may be diverse and filled with lots of competing values and points of view, I’m hoping to learn more about how these things can all live alongside each other in some kind of whole. When you stand back and look at the piece, I hope you’ll also feel it—that it all comes together –all those bristling powerful symbols and objects are all there, but somehow you feel the whole.